Monday Question Day- The Oldest Of Them All? 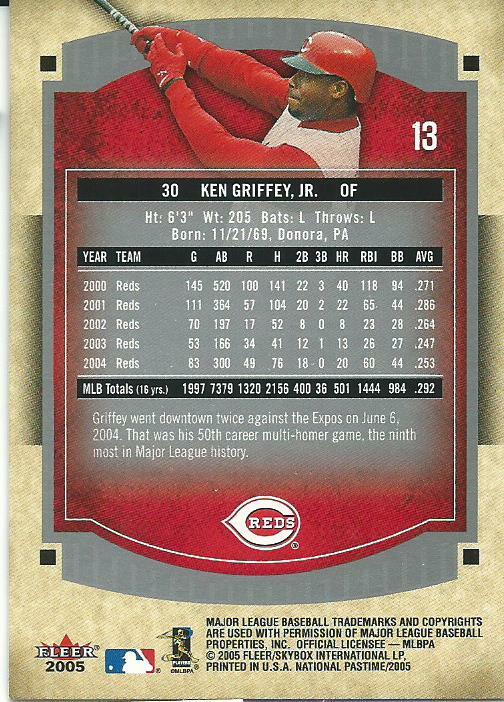 What are the oldest card in your collection? 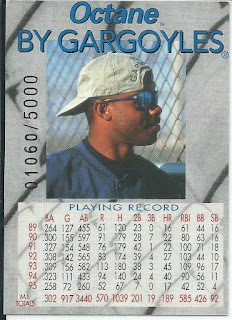 I posted a single card this week and that was part of Monday’s question so today I will make my complete focus on my Ken Griffey Jr. Gargoyles card. 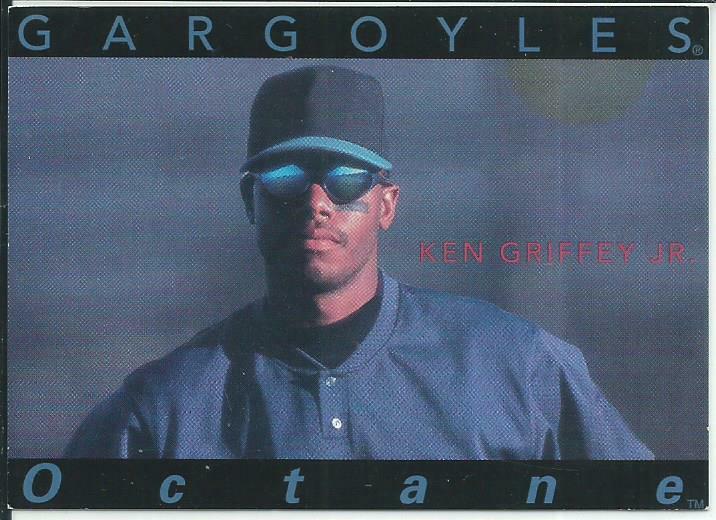 In 1995 Griffey signed a one-year contract with Gargoyles sunglasses, he was included in magazine and in-store advertisements and if you purchased a pair of his signature sunglasses there was a card included in the box. 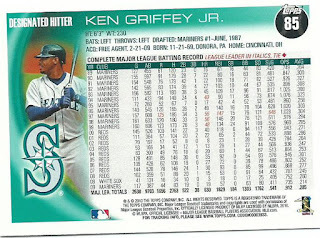 There were base cards that are #/5000 and there were also autographed versions but those cards are not numbered. I was walking my dog and came across this, a neighbor put an outgoing package next to the mail boxes and flipped the flag up on their mail box. It is bad enough that we have the old-school mail boxes in our neighborhood and they are easy for someone to pull up and grab mail out of without being noticed, this person is just making it easier for a thief to grab it. Whenever I sell cards I bring them to the Post Office even if it is a .99 cent card because I don’t want to take a chance sending it out in my mailbox. So the next time a card I bought doesn’t show up and the seller says it must have been stolen, this is what I will picture. It is official, the Seahawks have agreed to trade Marshawn Lynch to the Oakland Raiders for a trade of late round picks in the 2018 NFL Draft. Lynch, who is expected to take a physical in Oakland today, will sign a one-year contact for $3 million but will also include bonuses based on his stats and can end up hitting a max of $8.5 million. 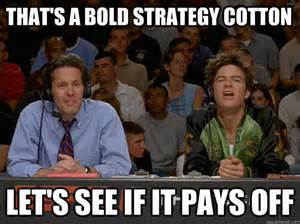 With the Raiders in the AFC I am good with this trade because Lynch gets to play for his hometown team and one last “Hoorah” and the Seahawks show their complete respect for him by working with what Lynch wanted. If the rumors are true than a group that includes Derek Jeter and former Florida Governor/ Presidential candidate Jeb Bush have won an auction to purchase the Miami Marlins. The information comes from someone with specific knowledge of the deal who spoke to Scott Soshnick who writes for Bloomberg. The Miami Herald has gotten in on the rumors too saying that an unnamed source says the price came out to $1.3 billion and the sale is waiting upon approval from the MLB. 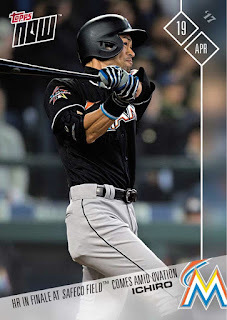 If the $1.3 billion is the actual price than this makes the Marlins sale the second highest selling point for any American sports team after the 2012 sale of the LA Dodgers, which sold for $2 billion. This doesn’t mean the Marlins are the second most valuable team, just that the Jeter group was willing to pay the insane price Loria thinks the team is worth. The most recent Forbes list of sports franchise value that I have found is from 2015 and the Miami Marlins are not even listed in the Top 50 list of American most valuable sports teams. 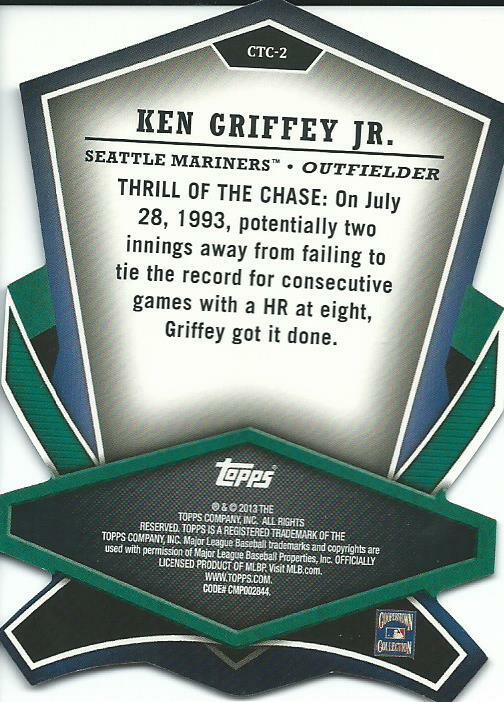 Is there a type of card you will not pick up for your collection? 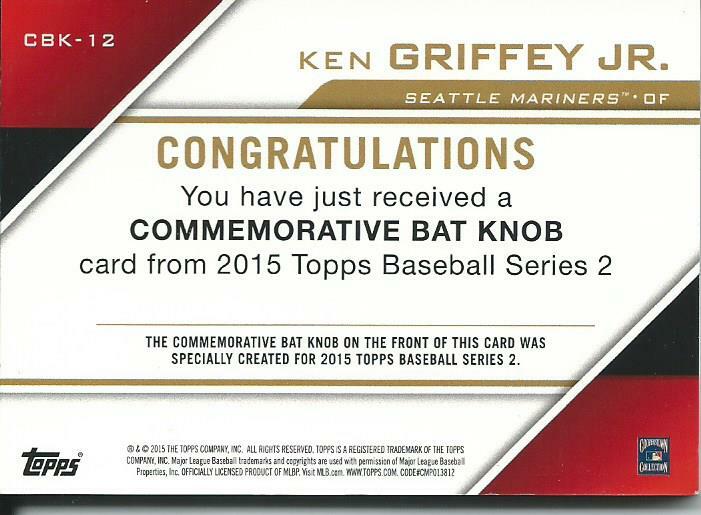 I have a couple of things that I do not like to include in my collection for assorted reasons. 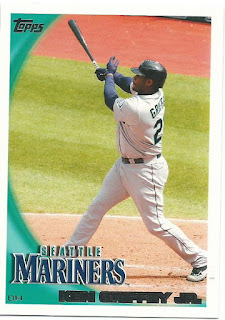 I do not like modern day mini cards or over-sized cards, too much of a pain to display or organize because of size compared to other cards in the set. I do not like medallions, commemorative coins/tokens, stamps or most manufactured relics either. These are just an attempt to add value to a release, which they don’t really, and they are usually significantly larger than a standard card so they don’t fit in binders. I have been dealing with writers block lately, I am just unable to be creative right now and it is frustrating. Most of the drafts that I had saved I have now posted because this block has been on-going for awhile now. 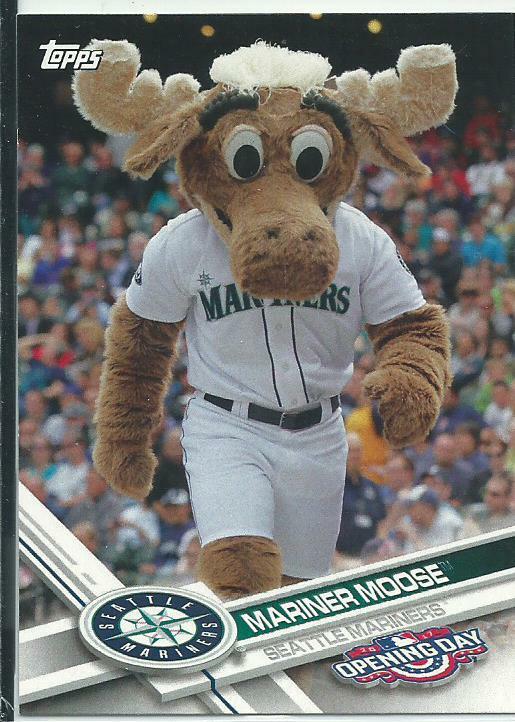 I will just go with a simple one-card post today about a card I just picked up for the price of a stamp, 2017 Topps Opening Day Mariners Moose #M-14. This is my 31st Mariners Moose card, counting the 5x7 Topps online specials and sketch cards there are 34 total Mariners Moose cards. Last night in Seattle former Seattle Mariner and future Hall of Famer Ichiro came to bat in the 9th inning and knocked a home run in what is most likely his final at-bat at SafeCo Field. It was his first homer of the season and 3,033 US career hit (4,311 counting his NPB career) and to top it all off it was Ichiro Bobble head Night. 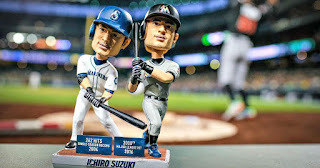 The giveaway was a double Ichiro bobble head with one statue representing his 2004 record 262 hits in one season as a Seattle Mariner and one statue representing his 3,000 career hit last year as a Miami Marlin. I plan on picking up the Topps Now card eventually but I am not a bobble head collector so I have no intent on getting one even if the prices were reasonable, even though it is a very cool piece. I just don't have the room to display them and they are huge dust collectors. I think that Topps has done an amazing job with the various Mars Attacks releases. 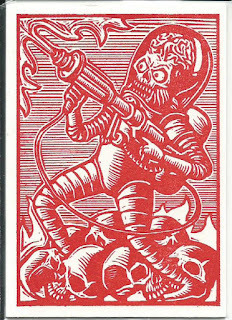 After 2015 Mars Attacks Occupation came out I was on the hunt for the Woodcut Art cards because of how distinct they are compared to other inserts from the set. What makes these Woodcut Art cards different is how they are printed and the ink that is used to print them. Instead of a modern day printing press they use a Heidelberg Windmill Platen press which literally presses the paper against the printing plates so only a couple of cards can be printed at a time instead of an entire sheet. 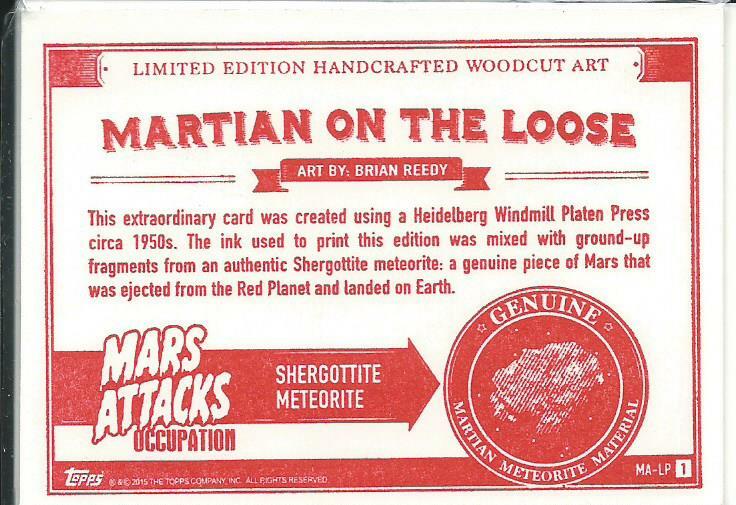 Second the Mars Attacks cards are printed using ink that is made up of fragments from the Martian Shergotty meteorite that struck Earth in 1865, Topps misspelled the name on the back of the card. 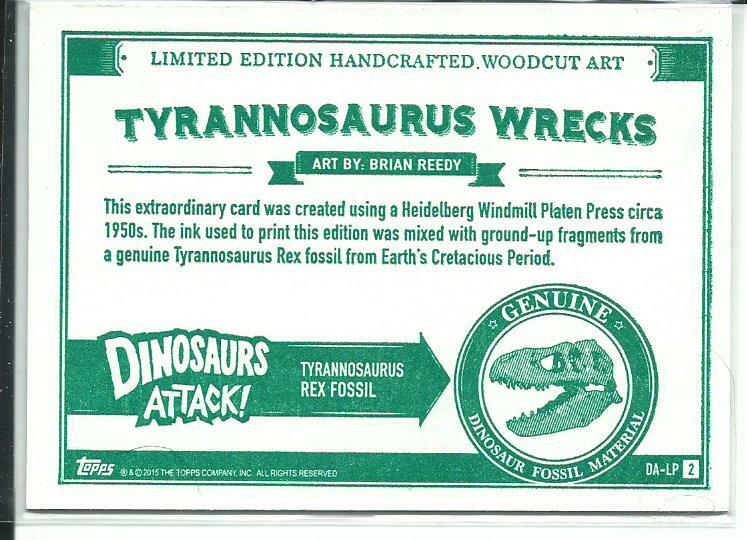 The Dinosaur Attack cards are printed using ink that is made up of fragments from a T-Rex fossil. 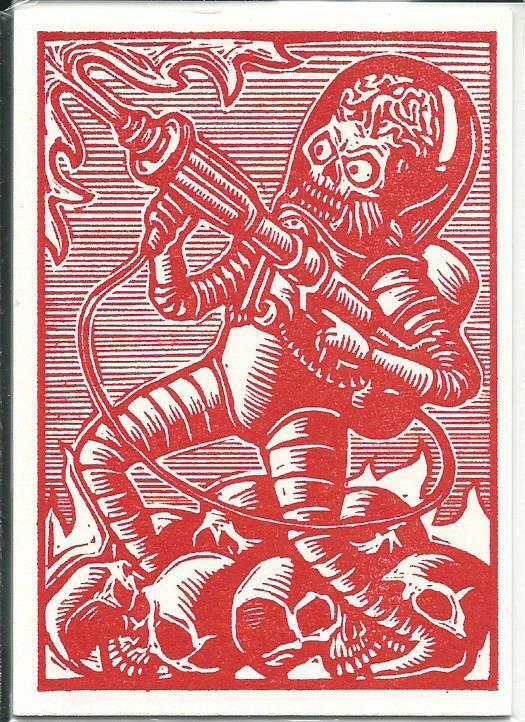 The insert set uses image from the base set and was made up 8 cards in the Mars Attacks woodcut cards, which are all red, and 4 Dinosaur Attack woodcut cards, which are all green. When I purchased the cards in 2015 they were about $10 each. 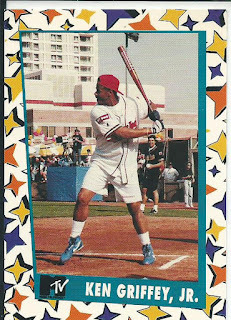 One of my final Ken Griffey Jr. cards of 2016 was from a unique three card set that was connected to MTV’s 3rd Annual Rock N’ Jock” Softball Challenge in 1992. 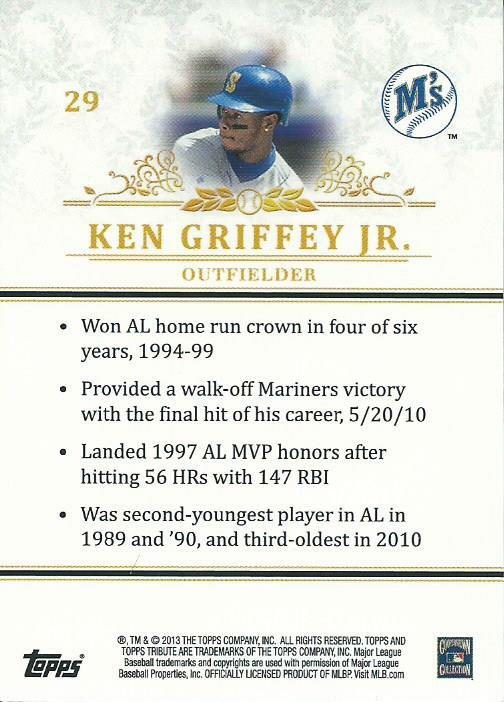 The set was just three cards and I am not even certain how they were handed out, I would think they were given out at the event. 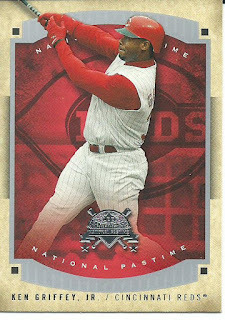 The other two cards in the set are MC Hammer and Frank Thomas. 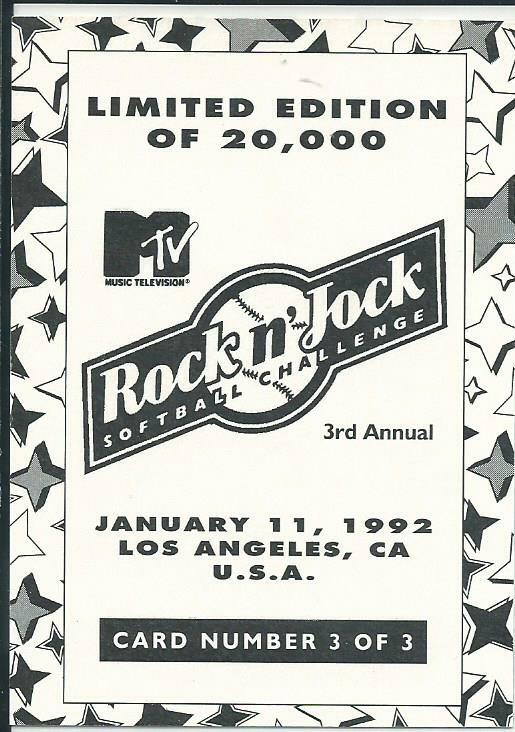 For those who may not remember, the MTV Rock N’ Jock challenges were an annual sporting events put on by MTV beginning in 1990 and teams with names like Bricklayers, Violators, Homeboys and Awayboys were made up of athletes, actors, comedians and musicians. Over the next 11 years MTV rotated the sports with basketball and softball both being played each year but they did toss in football twice, baseball twice and bowling once. 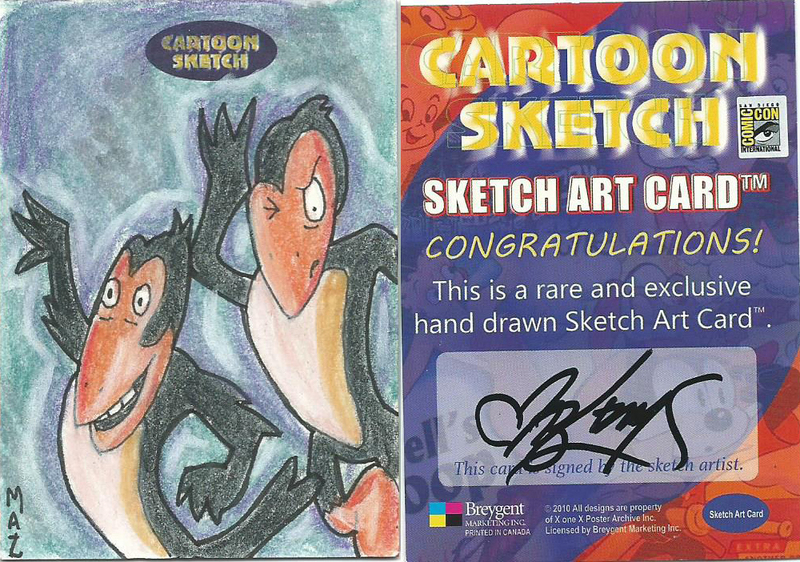 This month’s Art Gallery display comes from the 2010 Breygent Comic Con packs. 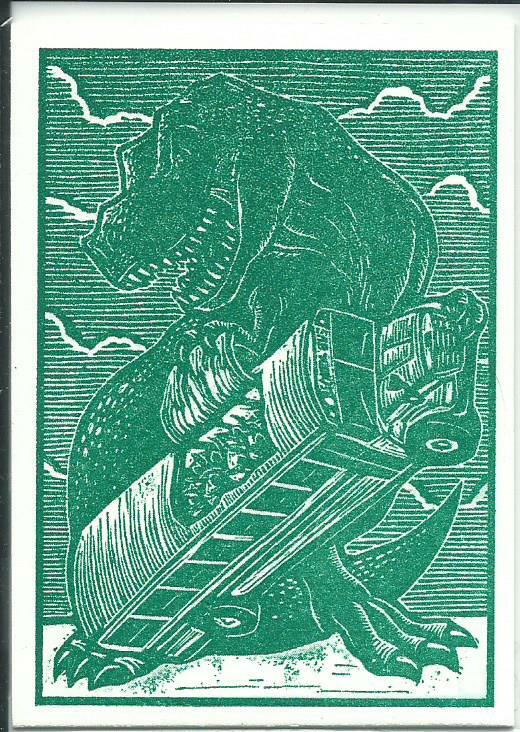 The artist is Maz Adams, an illustrator out of New Jersey. 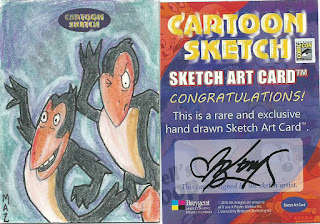 As far as being a sketch artist his work has only been included in Breygent’s releases but he is a talented artist. I recently viewed some of his artwork and he has some amazing silhouette pieces that really stand out. 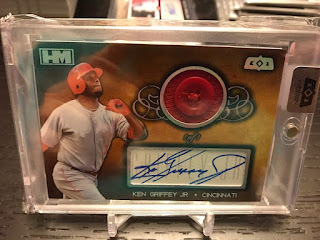 I had been watching this card for a month, maybe even a bit longer, and I was going back and forth on it before finally hitting the “Buy It Now” button. I loved Heckle & Jeckle as a kid, two mischievous magpies so I finally gave in for sentimental value alone. I grew up watching Heckle & Jeckle and some of my fondest memories were watching them while my mom shopped. 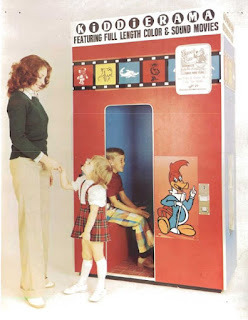 Anyone remember being left in a Kiderama Cartoon Booth while your parents shopped? I think the biggest prize was sticking your head in to an empty booth and see a cartoon still running. 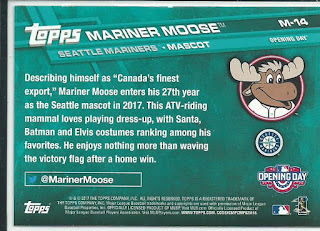 Two weeks ago Chris from The Collector put out a call for custom card designers to help him create cards of some of his female athletes who normally would not have a card, or at least a card in the sets he was interested in collecting. When I saw that he included University of Arizona alumni Jennie Finch and Seattle Storm forward Breanna Stewart I was happy to help him out. I was not able to make all of the cards, not yet, that he is interested in and currently the designs are just digital images he offered to send me some Griffey cards off of my Want List as a thank you for the work. I got the Griffey cards the other day and I am happy to share them. Thank you, Chris, for your generosity. I will need to set aside some time to create the backs for the cards so the cards can be printed out. 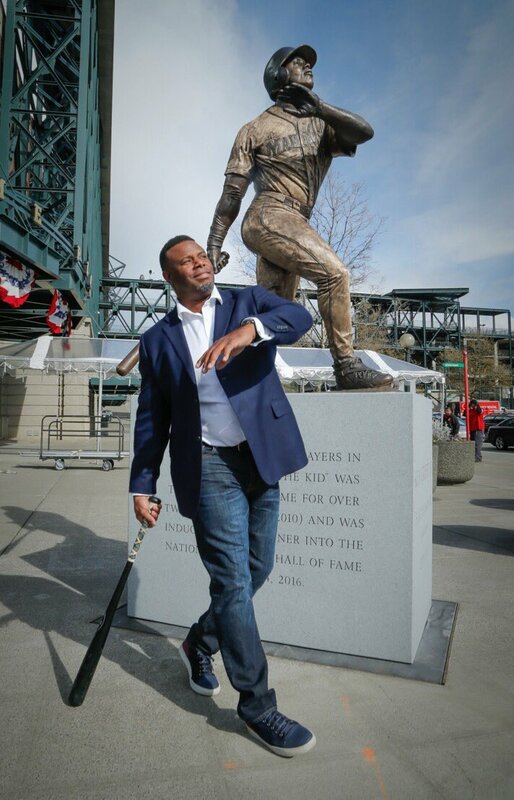 Yesterday the Mariners unveiled the new statue of Ken Griffey Jr outside of SafeCo Field. The statue is located on the corner of Edgar Martinez Dr. and Dave Niehaus Way, a location that is now being referred to as the Mariners Triangle. 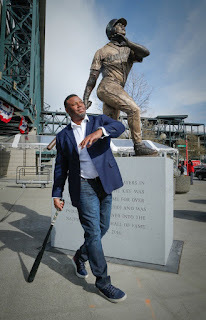 After the unveiling Griffey took his famous “swing” pose next to the statue, which is now my phone’s background. 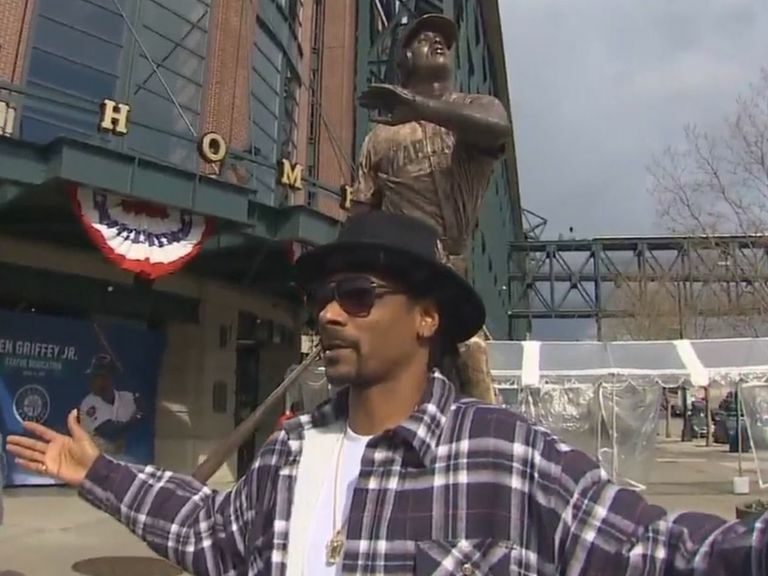 After the ceremony Snoop Dogg showed up, he said that he couldn’t make it to the unveiling but wanted to get his picture with the statue. He actually posted a video of his visit to the statue on his Twitter feed. 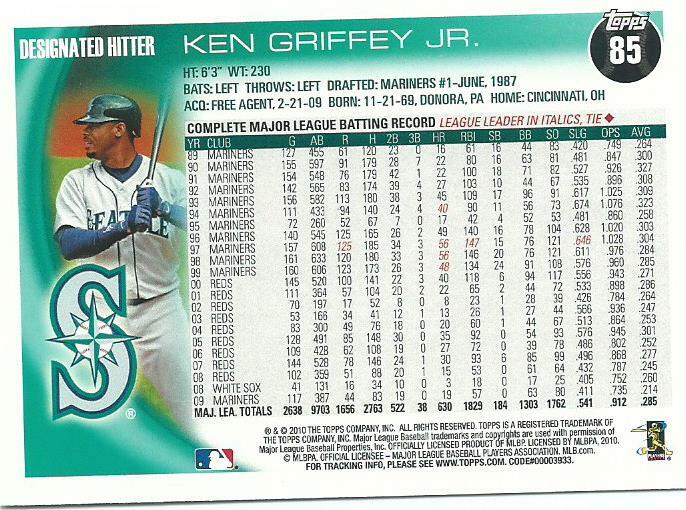 I do not know when I will head up to Seattle again but you can be sure that when I do I will be taking my picture with the statue and make sure to include some of my Griffey wallet card. I read a story today that has me a bit surprised in regard to a racketeering suit filed last week against Eli Manning, the NY Giants, Steiner Sports and others connected to a sale of memorabilia to three collectors. Eli Manning had a contract to supply his game-used equipment to Steiner Sports in 2010 and apparently knowingly Manning and the Giants supplied equipment that had not been used. 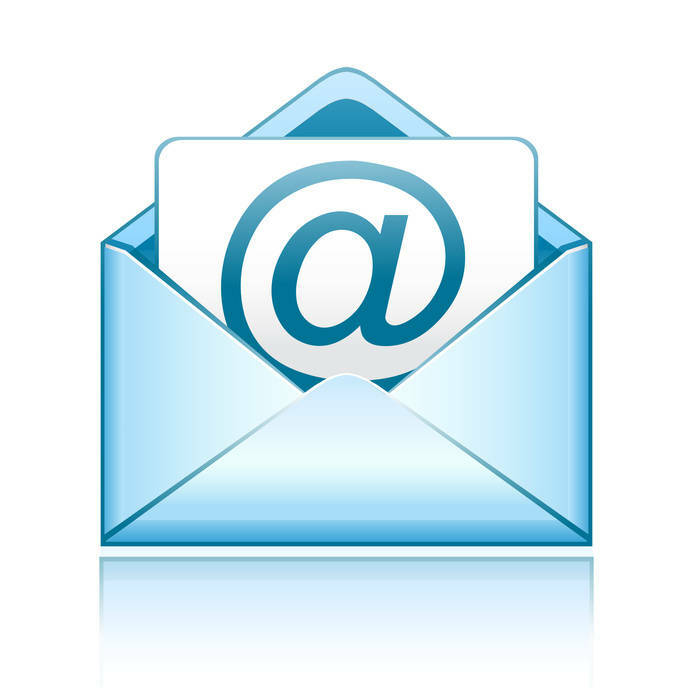 Initially the Giants were trying to play innocent but Manning turned over emails supporting the claims. In April 2010 the Giants marketing manager Alan Zucker asked Manning to supply 2 game-used helmets and 2 game-used jerseys. There was a communication between Manning and the Giants equipment manager Joe Skiba where Manning asked Skiba to supply him with 2 helmets that can pass as game-used, which Skiba in turn supplied. Prior to the lawsuit being filed last week one of the plaintiffs had an email exchange with Skiba where Skiba admits that he created “BS” versions for the game-used equipment because Manning didn’t want to give him the real items. So even though both Eli Manning and the team’s equipment manager Joe Skiba have turned over emails and have admitted to submitting fake items the Giants are standing their ground that this is all a smear job. 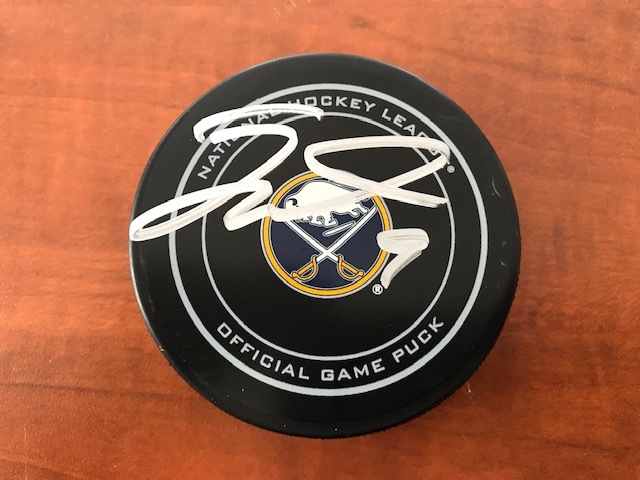 This isn’t the first time that the team has been accused of selling fake memorabilia either. 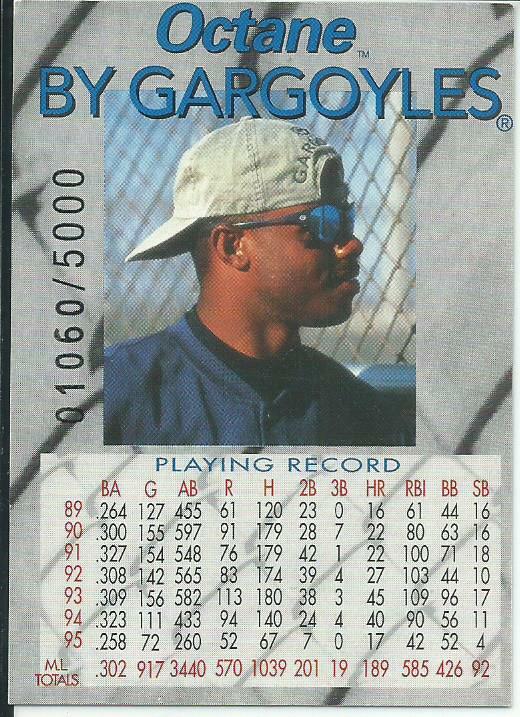 Barry Barone, who was one of the Giants team dry cleaners, has said that in 2001 he was asked to “beat up” unused uniforms from the 2000 season to make them appear as game used. 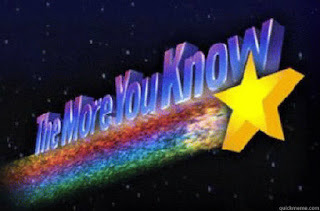 In 2008 Skiba was ordered by a team VP to doctor up a helmet to appear as Manning’s Super Bowl helmet so they could send it to the Hall of Fame. It has come to light that included in this lawsuit is a claim that in March 2016 Michael Strahan requested his Super Bowl XLII jersey from the team and they sent him a fake altered jersey. This is a travesty and I will go out on a limb and say that the Giants are NOT THE ONLY TEAM doing this, I am sure this is a common occurrence in all sports. 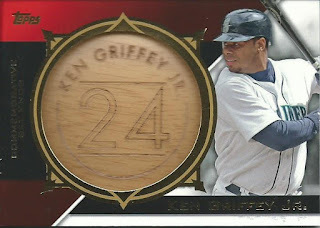 I don’t believe this is always the case, I am sure many teams sell plenty of game used jerseys but it is no wonder collectors are left wondering if the dime-sized white jersey relic in their card is real. The generic “Not any specific game or season” guarantees do not help alleviate any of the collector’s fears. 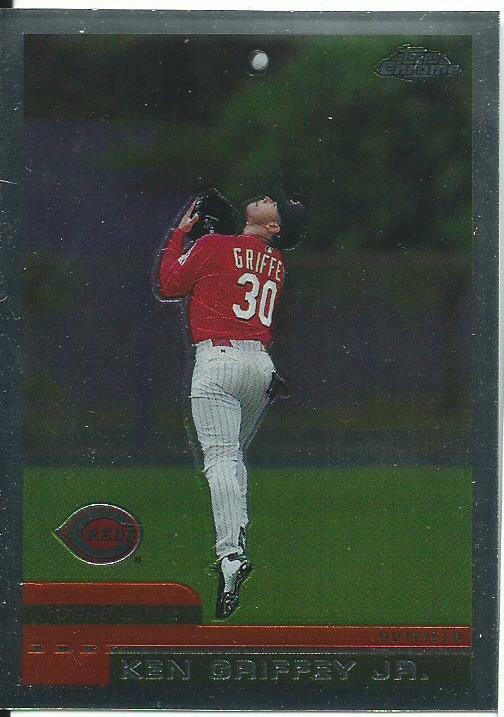 I like when find a card and you look at it and think “That design really works nicely”. I found two cards from 2016 Hit Memorabilia releases, one from their Fission release and one from their Cornerstone Collection release. Now when I talk about the design I do not include the lack of a MLB licensing so the Mattingly and Griffey cards do not have team names or logos, which would definitely add to the appeal. I am just talking about the actual design with background image/designs, player location and the layout of the die-cut windows. 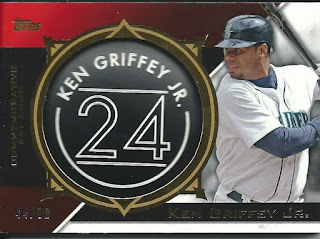 This is the kind of design I could see Upper Deck coming up with but Hits Memorabilia did a wonderful job here and I really appreciate the look of both cards, of course I would prefer the Griffey card but that is a bit biased of me. 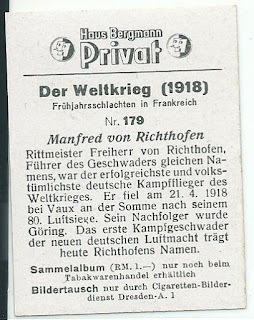 This month’s VCoM is another tobacco era German cigarette card of the Red Baron; this 1937 Manfred von Richthofen is from a pack of Haus Bregmann Privat and similar to the early American tobacco era cards there are a variety of backs. 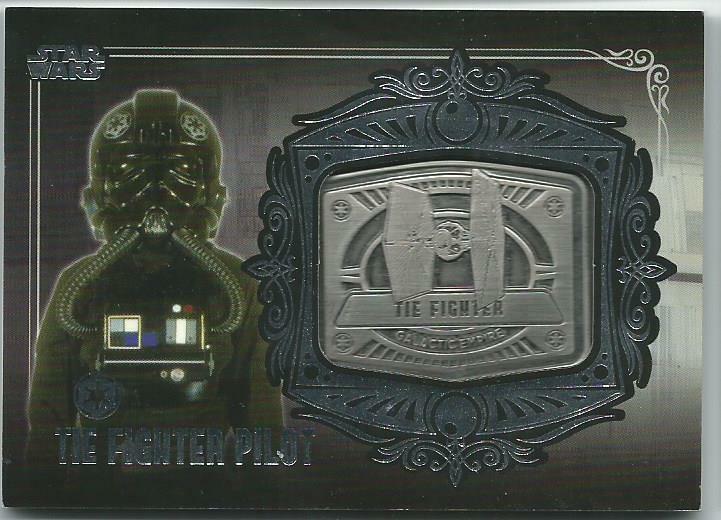 So far I have seen 6 different backs so of course I will eventually have to track down as many as I can find. 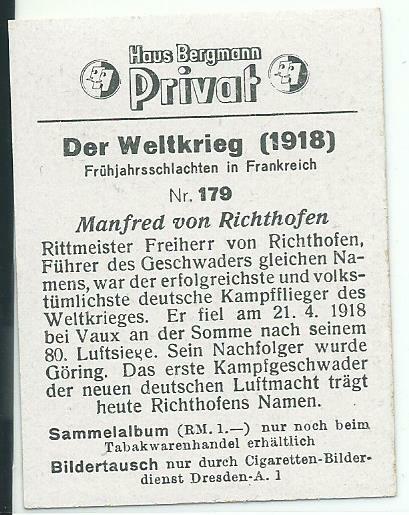 The back of the card says that he was the leader of the most successful squadron of the war but was shot down on April 21, 1918 after his 80th victory and was replaced by Goering (Yes, that Hermann Goering who became Hitler's #2 man). At the time this card was printed in 1937 there were 9 squadrons bearing his name. 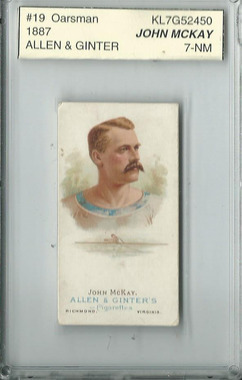 The card is rather thin, almost sticker like, and is not standard tobacco cards size being shorter than most tobacco era cards but wider. 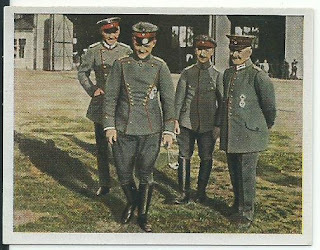 Richthofen is in the front (Second from left), I tried searching to figure who the other three men are with him but I was not able to figure it out. Sometimes I will look to past posts and see if there is a follow up that I can do to update a situation and sometimes a face from the past forces their way back in to the headlines which just shouts at me to do a follow up. This time it is Titus Young, the troubled former Detroit Lions wide receiver, who has spent more time in jail than in the NFL. 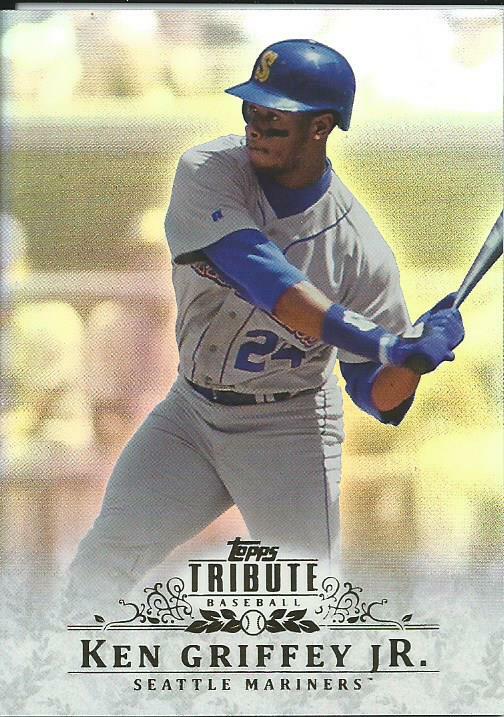 Here is the <LINK> to one of my former posts covering Young’s 26 game career with the Lions. In 2013 he was arrested three times in a one week period (twice in 15 hours) with charges of DUI, Breaking and Entering, Burglary, Resisting Arrest and Assaulting a Police Officer. 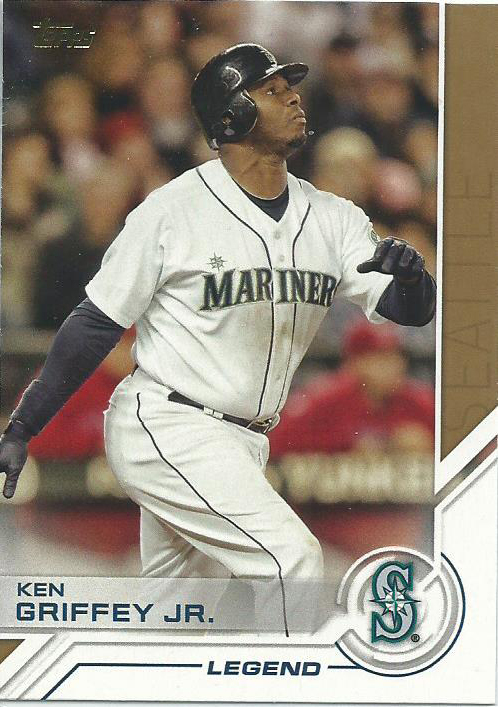 He was later arrested after a bench warrant was issued in late 2013 after he failed to appear on the burglary charges. In July 2014 he was arrested on five counts of Assault and Battery and eventually was sentenced to one year at an inpatient treatment rehabilitation center beginning in May 2015 plus five years probation. He left the rehabilitation center after six months and then immediately decided to attack his neighbor with a deadly weapon. The legal system has finally had enough of Titus Young’s antics and this morning sentenced him to 4 years in prison. He once claimed he was a Hall of Famer and better than every player on the Detroit Lions team but it can now be said that unless he goes to prison at Citrus State Prison (The Longest Yard reference) he is done with his football career. His father continues to claim that all his problems are directly connected to a mystery concussion (or series of concussions depending on when he talks about it) that was never diagnosed by a team doctor or independent doctor saying that his son’s brain is compressed to the front of his skull. I say to his father quit blaming Titus’ horrendous criminal decisions on everyone else and focus on the one consistent variable, your son. 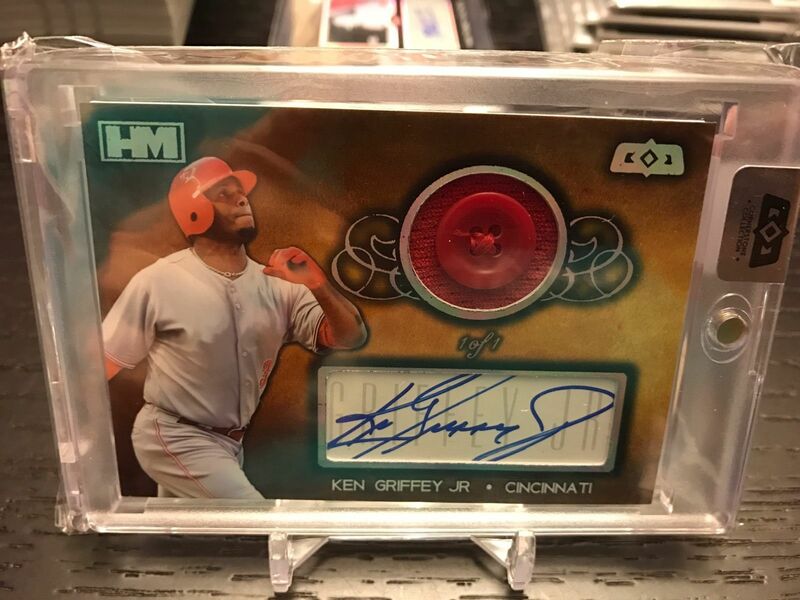 I do not own the card at the top of this post, I pulled it from eBay and I feel bad for the seller who has it posted at $149.99 BIN price. This is probably my coolest Ken Griffey Jr pickup of 2016 and that is saying a lot when you consider I picked up over 700 unique Griffey cards. The cards are manufactured bat knobs from the 2015 Topps Baseball Series 2 release but they are extremely cool. Once again the guy who had stolen my digital image of my What If? 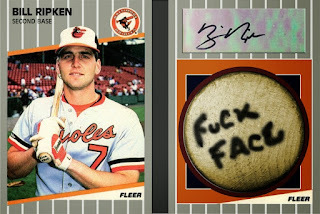 Billy Ripken bat knob card is at it again and selling the card again. When I contacted him on January 4th about it he ended the auction and while he gave me a shtick about why I should allow him to sell the card he did agree to not sell it. I have made it routine to check every so often and last night I came across the same guy selling the same card using my image to make a profit for himself. I tried to contact him through the question link in the auction but he apparently has turned off the "Ask a question" link for his auctions. I am guessing he probably gets plenty of complaints and won't face up to his actions. I had saved his emails from our conversation in January so I sent him an email regarding him selling my image and how I am done being polite. 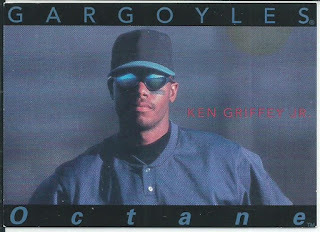 I submitted a report to the eBay VeRO department regarding him using my intellectual design to make money, I also made posts on Blowout Cards forum, Beckett forum, the Trading Card Database forum and the Sports Card Forum. Most people would respond the first time it was brought up and stop selling the card totally, scrap the image and move on but not this guy. Where a profit is to be made I am sure he is set to sell everyone else's work as his own. 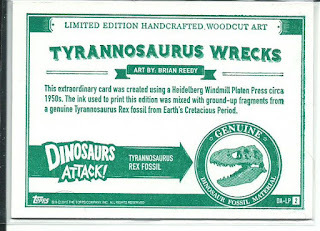 All of this could have easily been averted had he just stopped using a design I posted back in January but apparently the $14.99 he got from the couple of cards he sold was too much to give up. Now because he had to turn this in to a big blow up and continue to claim his friend own the rights to the card and if I pushed him to stop selling the card he was going to hunt me down and turn his friend's lawyer on me I decided to go all out to stop this guy from selling his cheap copies. 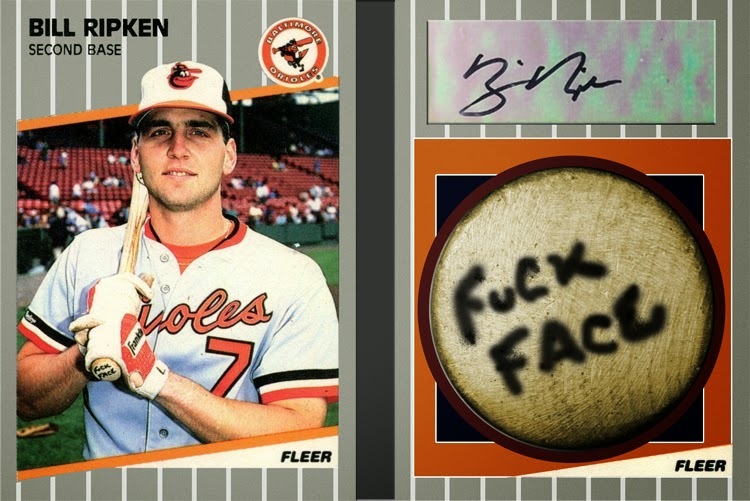 I contacted Topps, Upper Deck and Beckett because he is selling cards with their logos/watermarks on them and I already have gotten a response from Upper Deck and they are getting involved. According to Yankees color commentator Suzyn Waldman Yankee 22-year old prospect Clint Frazier asked if the team would un-retire #7 for him. After being asked by ESPN the Yankees GM Brian Cashman said that it was not true. Considering that Waldman has been covering the Yankees since 1987 you would think that she can figure out truth from rumor when it comes to the inner workings of the team so I am apt to believe her on this one. 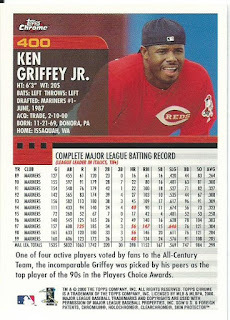 It may not have been an official request by Frazier but I am willing to bet somewhere along the line the kid asked the club house manager or someone connected to uniform assignments. Oh man Mickey is having a hell of a month. 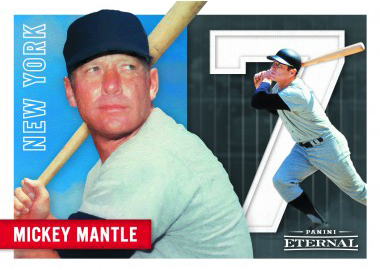 A couple of weeks ago it was announced that Topps was unretiring the #7 for their checklists and that the contract with the Mantle family has ended. Yesterday it was announced that Panini has signed a multi-year contract with the Mantle family and will be producing Mantle cards including cut signatures and memorabilia cards. The agreement is that Mantle will appear in six Panini releases a year plus he can appear on packaging materials for two releases a year. 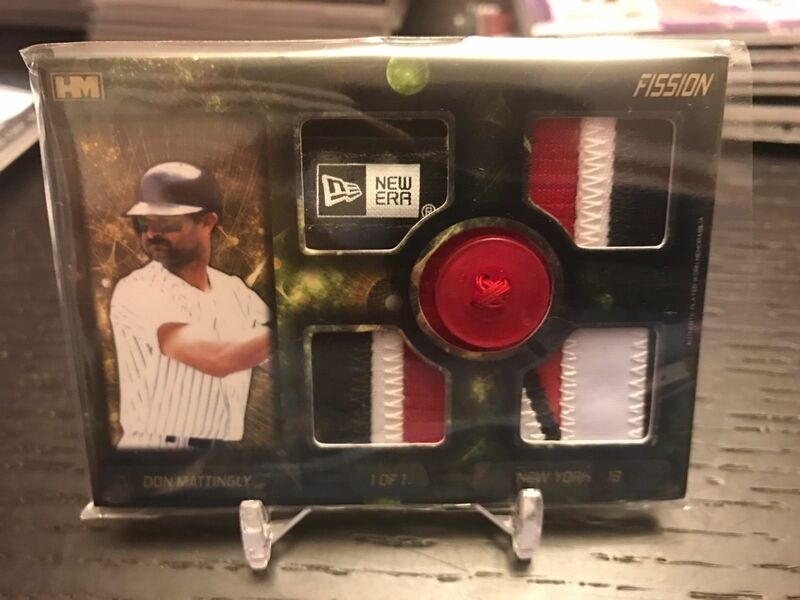 Mickey’s sons David and Danny said that the reason for the change was that they felt that Topps was flooding the market with their father in modern day releases. Obviously, this is code talk for “Panini offered us more money” because Panini will flood the market too. Just because his likeness can only be included in six releases does not mean that he will only be included on a couple of cards. Being in six releases will most likely result in hundreds of Mantle cards a year from Panini for the next couple of years and the worst of it all is that without the MLB license Mantle will appear logoless. 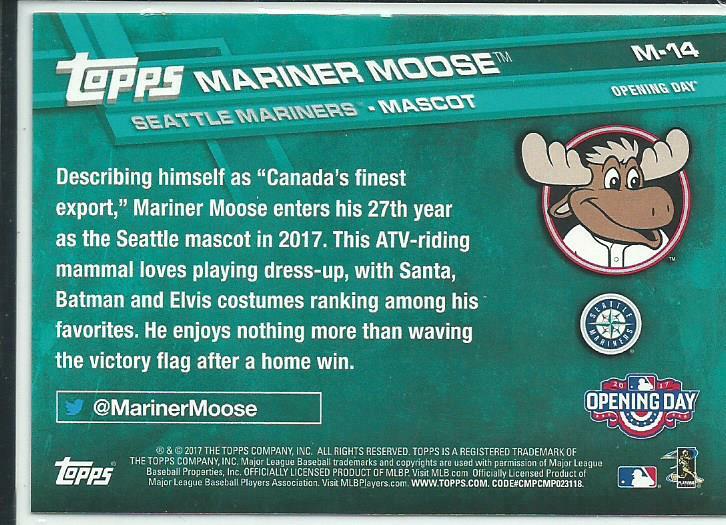 I expect we will see tie and golf shirt relic cards. His first Panini card is part of the online exclusive Panini Eternal release, seen above, and became available yesterday beginning at $9.99 each. His first packed out card will be in 2017 Panini Immaculate Baseball in August. Opening weekend for baseball and all baseball fans are excited. I normally do not watch much baseball because I don’t get a many Mariners games here but yesterday I watched the Diamondbacks-Giants game and it was pretty amazing to see Bumgarner become the first pitcher to knock two homeruns on Opening Day. 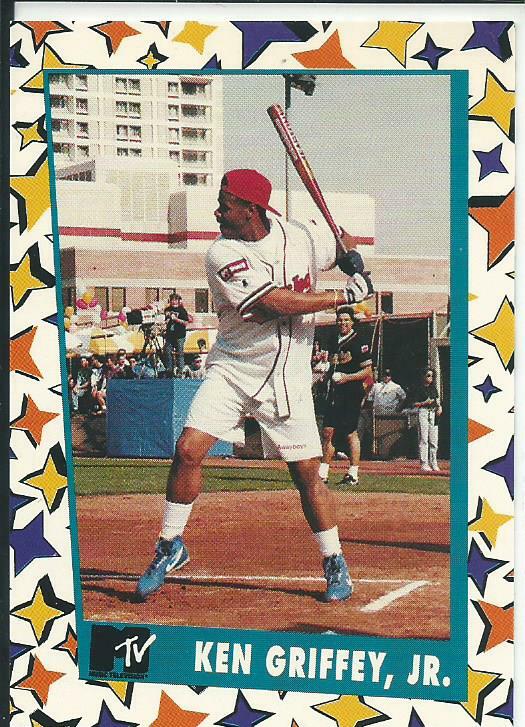 The second homer was almost on cue while the announcers were talking about it how it has never been done. The Mariners opening game just started so I will take this time to post the first card I bought this year. 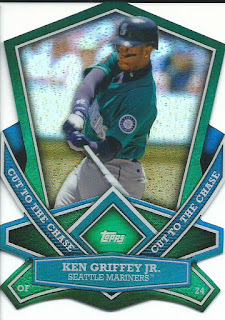 Nothing special, it is a 2017 Topps Series 1 Salute Ken Griffey Jr and I finally gave in and bought it because it was a 99 cent BIN with free shipping.